Large number of people in the globe depends on groundwater as a major source of freshwater. Here, we provide present-day regional-scale groundwater recharge rates in a major part of the Indian subcontinent. We have used a combination of ground-based observed water level data obtained from an intense network of observational wells, along with satellite and global land-surface model-based outputs to calculate our estimates. Large variations were observed in the spatial groundwater recharge rates over the region based on geology and climate. 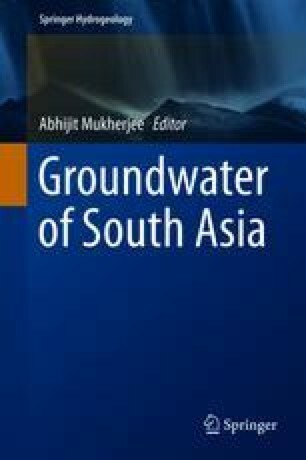 High groundwater recharge rates (>300 mm/year) are observed over the highly fertile alluvial plains of Indus–Ganges–Brahmaputra (IGB) system. Comparatively higher rate of precipitation, high porosity and permeability of the unconsolidated fluvial deposits and rapid groundwater withdrawal (>90% of groundwater withdrawal are associated with irrigation) synergistically influence high recharge rates. Most of the regions on the central and southern study areas exhibit lower recharge rates (<200 mm/year). Magnitude of estimated recharge rates was quite similar from different approaches of groundwater recharge calculation; however, inconsistency in the output of different approaches over some of the regions is discussed herein. SNB acknowledges CSIR (Government of India) for their support for providing the SPM fellowship. We also acknowledge CGWB, India and TRMM satellite mission for providing water level data and precipitation data, respectively. We also acknowledge APHRODITE database for providing precipitation data. The GLDAS data used in this study were acquired as part of the mission of NASA’s Earth Science Division and archived and distributed by the Goddard Earth Sciences (GES) Data and Information Services Center (DISC). We thank Pragnaditya Malakar and Charudutta M. Nirmale for their help in data retrieval. SNB thanks Dr. S. Verma for her advice.